(VEN) - Hanoi will have to stockpile VND28.5 trillion worth of consumer goods for sale in the months leading up to the week-long 2019 Lunar New Year holiday, Tet, about 10 percent higher compared with 2018. The Hanoi Department of Industry and Trade has promulgated its market stabilization program for essential goods to serve consumers during the 2019 Tet holiday in early February. Given consumer demand in previous years, Hanoi has anticipated the amount of goods required for the two months preceding Tet. Estimates include 190,600 tonnes of rice; 44,000 tonnes of pork; 14,600 tonnes of chicken; more than 12,306 tonnes of beef; 256 million poultry eggs; more than 254,400 tonnes of vegetables and roots; 11,200 tonnes of seafood, 3,500 tonnes of dry agricultural and forest products; about 3,000 tonnes of confectionery; 200 million liters of beverages; 200,000cu.m of petroleum; and large volumes of textiles, garments and home appliances. Supply sources will include manufacturing facilities, distribution and trading companies, and markets in the capital. According to Tran Thi Phuong Lan, Deputy Director of the Hanoi Department of Industry and Trade, the city has issued guidelines on stockpilng goods at reasonable levels for sale prior to Tet in order to prevent insufficient supplies or a high inventory level after Tet. So far, 18 companies have registered their participation in the market stabilization program. Some 10,428 points of sale with clear identity boards will be set up under the program. Three credit institutions have registered to provide businesses with loans totaling VND2.7 trillion. The city has organized a supply-demand connection conference to promote food and farm produce sales and discuss solutions for sustainable agricultural development. The capital also sent business delegations to participate in farm produce sale promotion activities in other localities, such as Hung Yen, Hai Duong, Bac Giang, Lao Cai and Lang Son. Through these activities, Hanoi’s companies have signed more than 400 memorandums of understanding and cooperation contracts to promote sales. 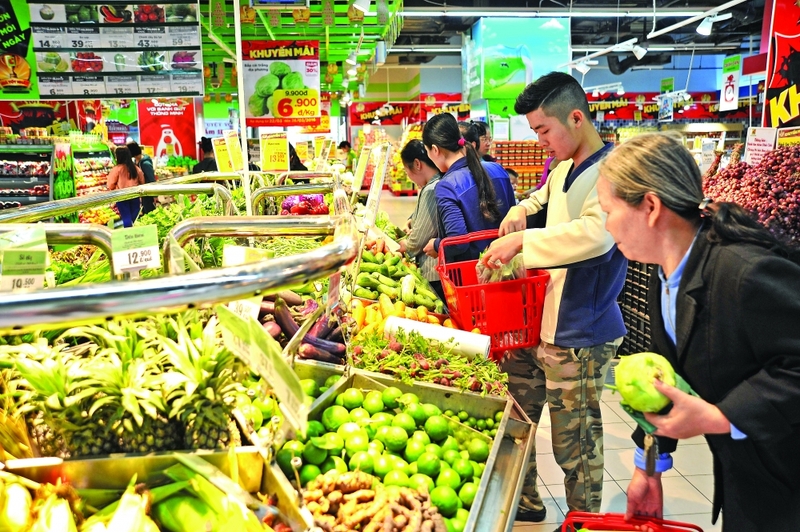 The Hanoi Department of Industry and Trade will continue developing the market stabilization program and provide guidance to ensure effective sale of goods for Tet at shopping centers, supermarkets, traditional-style markets, convenience stores, food and farm produce supply chains, as well as trading households. to prevent uncontrolled price increases.